Putin was once again asked about alleged Russian interference in the US election, adding that all Democrats and Republicans involved in the probe believe Moscow had intervened in the election process in the US. MOSCOW (Sputnik) — Concerns over Russia's potential interference in foreign elections have recently been raised in several countries. The issue traces back to the most recent US presidential campaign, during which Washington repeatedly accused Russia of meddling in the election and alleged hacking attempts. Russian officials have repeatedly denied any interference in the US presidential election or any other foreign elections. 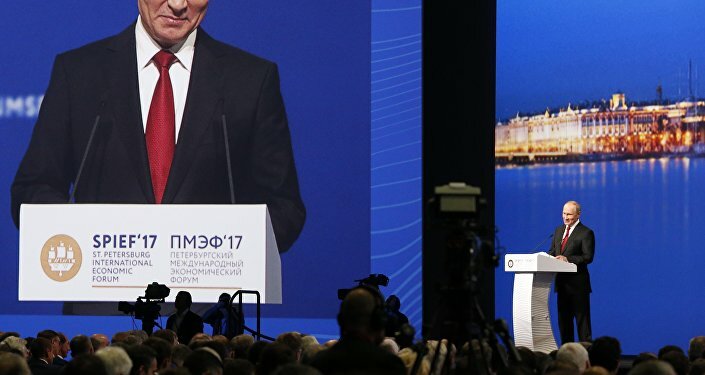 "I think this useless, damaging talks should simply be stopped… It is harmful, it brings damage to international relations, the world economy, security issues, fighting terrorism as well," Putin said at a SPIEF plenary session. Putin asked if the journalist read the US report on Russia's alleged role, adding that he did and it was based only on assumptions. He questioned the independency of the Russia probe, adding that there's noting completely independent in the world and personnel appointments in US special services prove that. Putin said that he did not find any specific information, which could prove the allegations of Russia’s interference in the foreign election after reading the reports on the issue. "I read these reports. There is nothing specific in it, only suggestions and conclusions made on the basis of assumptions. That is it. If there is something specific, then it will be a subject of discussion," Putin said. Putin mocked the allegations that there are Russian hackers' fingerprints in the case of the DNC account cyberattack. He said:"fingerprints of what exactly? Fingerprints of snouts and horse hooves? Even IP addresses could easily be faked." He said that the Democrats should have simply agreed that it had failed to attract voters, adding that their is no desinformation in information on manipulations of the Dems in the US and the resignation of the head of the chief of Hillary Clinton's staff proves it. "It's easy to say 'we are not guilty, it's the Russians who are guilty — they interfered in our elections, but we are good," Putin said. "In general, it reminds me of anti-Semitism — the Jews are guilty of everything, you see? We all know very well where these attitudes could lead to. They do not end with anything good," Putin stressed. "Just stop it," he concluded, commenting on the baseless claims. The 21st SPIEF kicked off on Thursday for its 3-day run, gathering high-ranking politicians and prominent business leaders from dozens of countries in the Russian city of St. Petersburg. The Sputnik news agency is an official media partner of the forum.